The Stadium „Arena Lviv“ was designed by the Austrian architect DI Dipl. TP Albert Wimmer for the European Football Championship 2012 in Poland and the Ukraine. In the preparation of the construction the Bureau Wimmer also designed the master plan for the area. With the strength of past experience in constructing a football stadium – Wimmer also designed the Austrian Stadiums Salzburg, Klagenfurt and the modification of the Stadium “Tivoli neu” in Innsbruck for the European Football Championship 2008 in Austria and Switzerland – the Austrian planning team cooperated with the Ukrainian architects “Arnica” who finally filed the project. The Arena Lviv, located in the southern part of Lviv, is one of the newest stadiums in Europe. The building lot is about 9 hectares in size. The Lviv stadium is designed for 34,915 seats, of which 408 – for business guests and 192 in VIP-zone. Additionally, during EURO 2012 the arena will offer 522 seats for media representatives and 104 for the disabled. All seats for spectators are placed under the roof, some parts of which are transparent to provide sufficient sunlight for the fans as well as for the turf. The stadium’s parking will be located underneath the arena which will consist of three levels, built with armoured concrete. The Arena also offers parking for the disabled and special elevators will provide passage to seats that are also designed and reserved to accustom the necessary personnel. The arena’s western stand has a five-storied administrative building. There are rooms for players and coaches, press centre, conference room, area for VIP persons, premises for the organizers of the championship, as well as many commercial areas. During football matches and other mass events the guests are offered 19 fast food restaurants, located on the promenade of the Arena Lviv and seven fast food restaurants in the outer perimeter of the stadium. This location combines the sports and shopping centre with important functional areas of the city. The extensive area around the stadium can host here the largest in western Ukraine sports and entertainment shows, festivals and concerts that can be attended by more than 120,000 people. The football stadium is built in full accordance with all requirements of UEFA for lighting systems, sound, security and telecommunications. Constructing a state-of-the-art stadium demands a forward-looking cost calculation. The architecture office Albert Wimmer ZT-GmbH held the building costs very soon in a high regard. As soon as the design process began, Wimmer set structural measures to reduce the costs and brought these forward in the submitted project. These cost reducing measures were to be carried out during the execution phase. Because the involvement of the office Albert Wimmer ended with the building permission, these suggested measures didn’t get round to be realised. In his design architect Albert Wimmer was keen to avoid the image of a raree show, but to bring the audience as close to the playing field as possible. „In my architectural language the combination of playing field and running track is excluded, because it will always be a break between players and audience. Soccer is passion and as a spectator i want to see and feel the efforts and the fights of the players as close as possible“. One of the main features of the stadium is its promenade, which will separate the flows of visitors between the first and second tiers of the arena. This section mainly houses dining and sanitary zones. The stadium officially opened on the 29th of October 2011 with a theatre show. The first match was played about two weeks later, a friendly between the Ukrainian and Austrian national teams which ended in a 2-1 win for the hosts. During EURO 2012 the Arena Lviv hosted three Group B matches. In February 2012 the Arena Lviv has been voted the 8th best football stadium of the world. 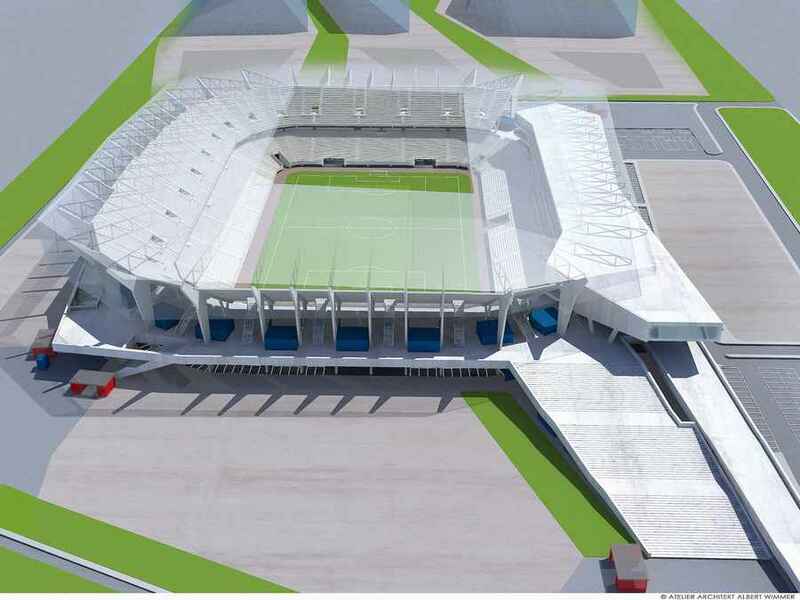 This the result of the Stadium 2011 contest conducted by a popular Polish Internet portal. The Ukrainian Arena Lviv polled 8,200 votes and won the honored eighth place between the Juventus Arena and the stadium of Istanbul’s Galatasaray. According to UEFA experts, especially Mr. Markiyan Lubkivsky, EURO 2012 Director in Ukraine, the stadium Lviv convinces particularly through its convenient terms of management of large flows of people and transport logistics and has any right to claim the status of being one of the most comfortable stadiums.